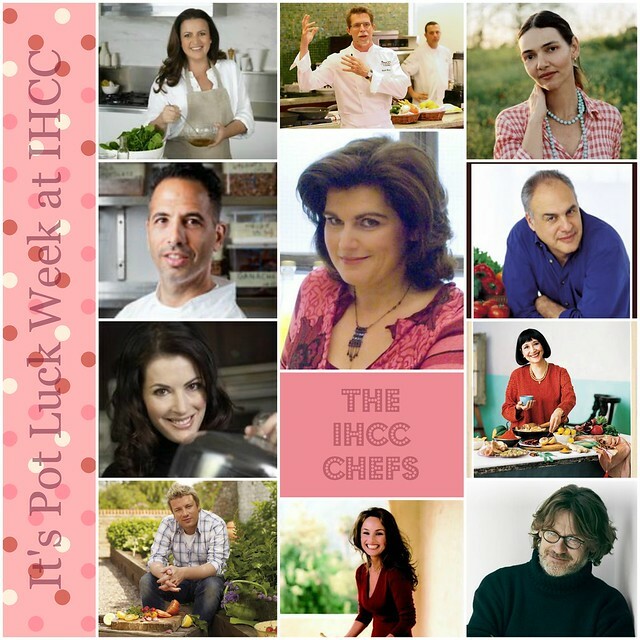 "February Potluck", the theme for this week at I Heart Cooking Clubs (IHCC). For our potluck week, we are free to cook with our current or previous featured chefs. I've decided to cook with Madhur Jaffrey for our Potluck week, with one of her many dishes that I've bookmarked to try (one off the list now! ), Fenugreek Chicken. Fenugreek Chicken is a dish that I've been wanting to cook for ages. This lovely recipe is from her book "Curry Nation" and can also be found here. The recipe uses chicken thighs, but I''ve used chicken breast meat instead as that was what I had. And I've used a small tomato instead of chopped canned tomatoes, as I've ran out of canned tomatoes and only have one small tomato in my fridge. I've added a tablespoon of tomato paste to make up for it. The next time I would make sure that I have some canned chopped tomatoes ready or at least a few fresh ripe tomatoes available, as this dish is really nice, and I'm sure that the gravy would taste even better with more chopped tomatoes. The other changes I've made was to add a little more of chilli powder and garam masala and an additional tablespoon of dried fenugreek leaves, than the recipe calls for, as I'm all for bold flavours in a curry or spicy dish. Have you used dried fenugreek leaves before? They are called as Kasuri Methi and are the dried leaves of the fenugreek plants. These dried leaves are really nice, they have a strong herby aroma with a distinctive taste, and provides delicious flavour to the gravy, hence the extra tablespoon! This dish is easy to cook, and delicious! I love the taste of the dried fenugreek leaves in the gravy. The distinctive taste and aroma of the leaves really stands out, but in a very delicious way. This chicken dish is very good eaten with plain white rice and some side veggies. Yum! Set a 25 centimetre (10 inch) pan over a medium heat. Add the oil and, when it's hot, tip in the onion. Stir and fry for 10 minutes, or until it is light brown, then add the garlic and ginger. Stir and fry for two minutes. Now add the chicken and brown for two minutes. Put in the tomatoes and green chillie. Stir for two minutes, then add the salt and turmeric. Mix well for five minutes before adding the chilli powder and garam masala. Stir and crumble in the dried fenugreek leaves. Mix in 360ml (13fl oz) of hot water, or enough just to cover the chicken, and bring to a simmer. Cover and cook over a low heat for 20 minutes, then serve. I'm linking this post with I Heart Cooking Clubs (IHCC), theme for this week "February Potluck"
It looks very delicious! This year I must try to dry some methi leaves too. If you mean dry fenugreek seeds, then it is not the same. The taste between the seeds and leaves are really different, so it is advisable not to interchange them in this recipe. I bought the dried fenugreek leaves from the supermarket, packed in a box. Try looking for it under the name "Kasuri Methi". If you can't find it from the supermarket, you might be able to get them from any Indian grocery store. Dried Fenugreek leaves were so difficult to find here but thank goodness I did finally find them in an Indian Grocery store. However, I've had them so long because there was a recipe I wanted to try them in and would you believe I lost the recipe!!! Thank goondess you have posted this one! Now I can finally use them. I'll have to slim down the serving though. Marion is not into bold flavors these days. Your looks delicious Joyce. I love the color the tumeric adds too! I definitely need to get some fenugreek leaves! Fenugreek has been on my radar screen for a while, both for baking and cooking. Now this is more than a passing thought. Nice dish! I've never cooked with fenugreek before, nor have I tasted it. I will have to keep an eye out for it when I'm in the specialty stores. My family loves a saucy meat dish full of flavor served over rice with veggies on the side. This looks like something we would love!